3D Object movie is a perfect choice to display interactively on the web, a product, an art object, collectible, antiques or museum pieces, even miniature landscapes or bonsai. It allows the viewer to manipulate an object with mouse and analyze the object from all the sides and different directions. It is an interactive photograph, a sequence of photographs taken of a product from every angle that gives the impression of a tangible, three dimensional real object. There are many software programmes existing in the today market having as input a set of high resolution pictures and output an embeddable object. In the software used by us, you can create high quality 3D object movies (Flash or QuickTime format) which can be rotate 360 degrees. The view at a given angle can be animated or manually selected. When take pictures it is mandatory to fix the photo camera on a tripod and to use a turntable to rotate the object at the desire angle (10, 30, 45 degrees) until rotate completely. Of course, higher quality pictures translate into a higher quality 3D object movie. A photo studio with controlled light and a professional camera and lens ... helps a lot, but you can obtain good results even with an ordinary photo camera. Object spins can be single-row (rotating around the vertical axis), or multi-row (able to be rotated around both the horizontal and vertical axes). It is quite difficult to make a multi-row object movie and for sure you'll need a professional equipment for this (photo camera, tripod, turntable and special accessories, photo light kit) - you need to take many sets of pictures at same distance to the object but in different vertical planes, maintaining same angle when rotate the object in horizontal plane. With a two-axis movie, the user is able to tilt the object to see it from above and below the horizontal while also turning it about its vertical axis. Another exciting possibility of this software is the user enabled zoom, with buttons that allow the user to zoom in and out. Also you can add multiple buttons to rotate object, to change spin direction or to maximize the image to a full screen. Till today, Google Blogspot doesn't allow you to upload and host a Flash file, but there are multiple other ways to host such a file on a third party provider. Once you uploaded your file (with .swf extension) you can embed your Flash application into your post as a HTML code. As we already said in our first blog post, we are also enthusiasts about oriental art. 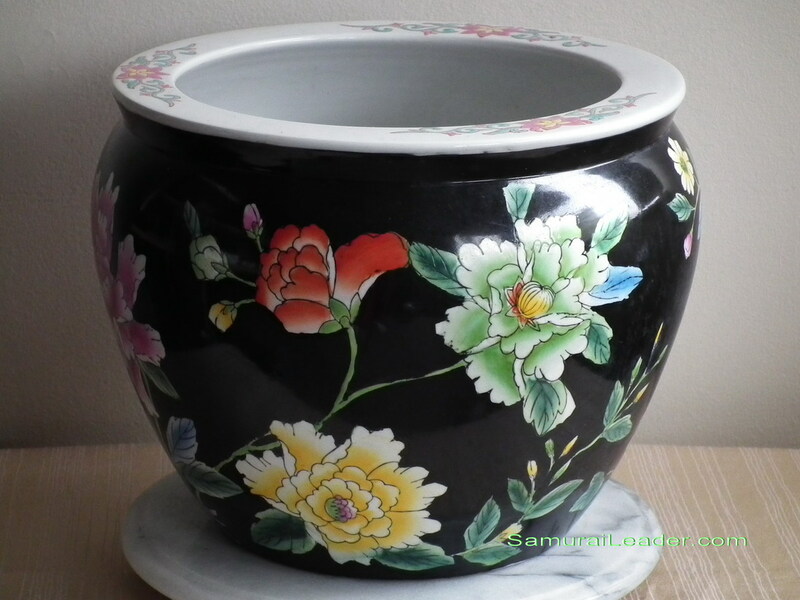 So we chose for today demo an amazing old Chinese Fishbowl / planter made from Porcelain with height - 26cm and width - 32 cm. This piece of art was hand painted with vivid floral motifs to the exterior and with Koi fish and aqua-plants to the interior. Use your mouse to spin / change spin direction / zoom the object. If you want to showcase your product as a 3D Flash Object Movie on your website, we can help you to identify the right solutions that are best for your business. Contact us at admin@samuraileader.com if you want to learn more about this technology and how may suits your needs. Send us a sequence of pictures taken by yourself and we'll provide you the embeddable Flash file and as a promotional offer we will make the first 3D object movie for free.